Warner Road, westbound approaching Harl/Emerald. Warner resurfacing; begun Nov 2016. 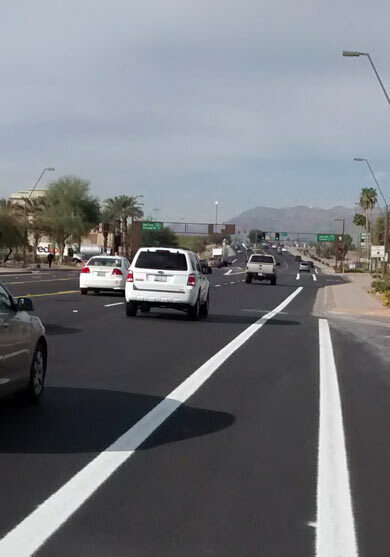 The “permanent” stripes (the 8″ wide BL stripe with glass beads) were finally painted sometime very early January. Before that in several areas there was no (BL) stripe. In other areas the BL stripe was just paint and 4″. In this particular spot the BL stripe for no apparent, or good, is only 4′ wide usable. 5′ of usable space should have (and could have) been maintained. Lane 2 is very wide (14′?). Also, the BL stripe should be continued as dotted (the “optional” dotted line). The road here is *massively* wide, almost 80′. And that’s before it flares even wider for the RTOL lane(s) where it’s over 100′ wide. In the foreground, where there are two BL stripes, the width is a mere 5′; there’s no reason that shouldn’t be six feet… Right now to the right of there is unused pavement, but it’s some sort of future driveway lane, and as you can see it’s very narrow (9 or 10 feet to the curb?). The optional dotted lines should be added.